Cut chicken into bite sized pieces, coat with 1/2 packet ranch seasoning. Saute in a skillet with 1 Tablespoon of bacon grease along with bell pepper and garlic. When chicken is cooked completely, drain grease from skillet. Pour one jar of alfredo sauce and milk into skillet with chicken. Stir in the rest of the ranch seasoning. Simmer for five minutes. Set aside a handful of bacon crumbles for top. Begin layering casserole with half the remaining jar of Alfredo on the bottom of a 13 x 9 pan. 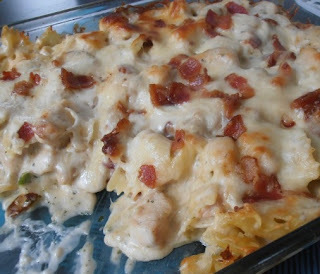 Then layer 1/2 of the pasta, chicken sauce, and bacon, followed by 1 cup of cheese. Repeat. Finally cover with alfredo sauce, 3rd cup of cheese and bacon that had been set aside. Bake for 30 min on 350. Serve with garlic bread. ENJOY! !